Furniture Fix the quick fix for old sagging furniture. Furniture Fix the quick fix for old sagging furniture. Save money and your furniture. Weak sagging springs lead to uncomfortable sagging furniture, Furniture Fix as seen on TV provides instant support to sagging springs. So why throw out our favorite chair or sofa when you can renew it and experience great support with Furniture Fix. Easy to use, no tools required, just place Furniture Fix under sagging cushions for instant firmness. The six panels interlock instantly and are customizable to lift and fix sagging upholstery of any size. The especially designed to stand up to heavy use. Experience renewed comfort with Furniture Fix! Each panel measures approx. 19"Lx4.5"Wx1/2"H. It is recommended that you use 1 set for an upholstered chair, 2 sets for a love seat and 3 sets for a sofa. My sofa is VERY old and the springs in the center finally gave way; my budget does not include a new one or even having the springs replaced. This did not restore the original support, but at least I no longer feel like I am sinking to the floor! The product didn&apos;t really support the cushion on my couch.I was gonna use it just on the middle cushion,and it was still the same after applying the fix-it furniture. I have a favorite recliner chair. Over time the frame and spring gave way. My son rebuilt the frame, but could do nothing with the spring. I use a pillow and a shelf, temporarily . But bought the furniture lift, and it works great. I do have to rearrange it , once in a while, as it tends to slide back. The product works fine. It makes it much easier to get out of a too soft couch. However one set is only large enough for one seat. For a love seat you need to get two sets. It was on back order for a month, it didn&apos;t tell me that until I had paid and checked out. I ordered two of them so they&apos;re under two cushions of my couch. Kind exspensive for what they are and how they&apos;re made. Didn&apos;t do what I was expecting, when I sit down I hear a click sound, they don&apos;t bare weight very well. They do help a little. The product is effective. The plastic slides are very durable and resistant to a lot of weight. Overall effectiveness depends on quality of bed or sofa. Works great on newer sofas and mattresses that are not so worn down and soft. I had used the Furniture Fix on a couch and was thrilled with it. When my patio loveseat began to sag I looked all over for another. I was SO happy to find that I could purchase it online. Like I said, they work fine for me. Just the right firmness. made my sagging couch much better. I bought this to increase the comfort of our loveseat. It did nothing to help it. I would NEVER purchase this product nor recommend it. I don&apos;t see how this could help a couch support a child, let alone an adult. The assembled unit it just too light, too lacking in structure, to help. I found that using the lit from a Rubber Maid tub was far more effective, although it tended to slide. Save your money exactly what I thought would happen did, I got a cheap useless product from the TV...I took nearly two months to arrive I actually forgot about it until it showed up...lol The thing is cheap, flimsy and didn&apos;t work at all, yeah so I bought a new game room couch in the end. It did what it advertises. I purchased this for a sagging sofa. The only unfortunate thing is for a sofa you will need to use two of these kits. 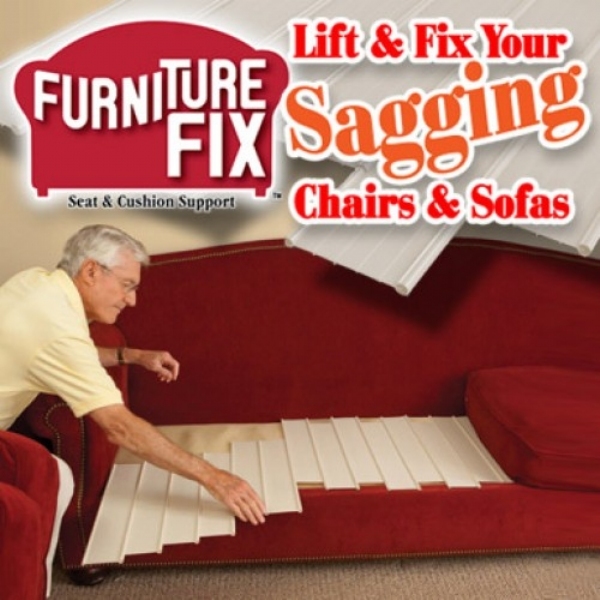 once you do your sagging sofa problems will be over. However one of these by themselves fixed our living room wing chair. I enjoy they very well it will help keep my things new and nice . We used the furniture fix for couches that are in our basement for our teenage children. The spring mesh was exposed and ripping at the cushions which were all in pretty good shape. These were couches that we LOVED and were super comfortable so we really didn&apos;t want to throw them out. They furniture fix worked great! It seemed like a quick fix to the couch. The panels are easy enough to put together but the snap on end caps are a nightmare. There are 12 per set. Eleven fell off the first time we sat down. I think that they are used so the plastic ends don&apos;t destroy the cushions. We finally glued them on. It would be a better buy if they were put on in the factory.